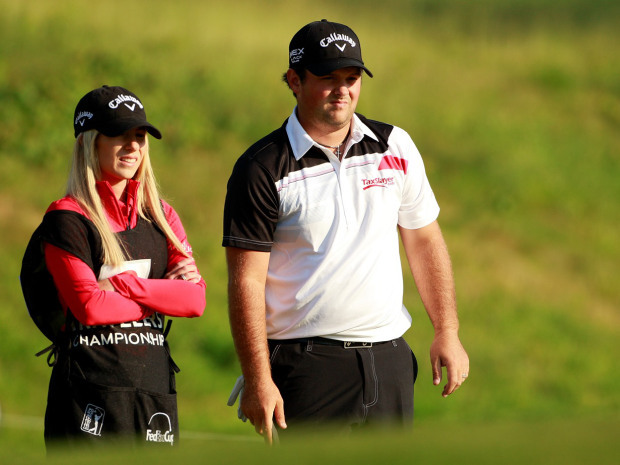 When it comes to successful alumni in the sporting world, no one is hotter right now than golfer Patrick Reed. With over $2 million in winnings already this year and a 2014 campaign that saw him rack up two wins and four Top 10 finishes, not to mention over $4 million in winnings, the San Antonio-born Reed is certainly on fire. After winning two NCAA Div. 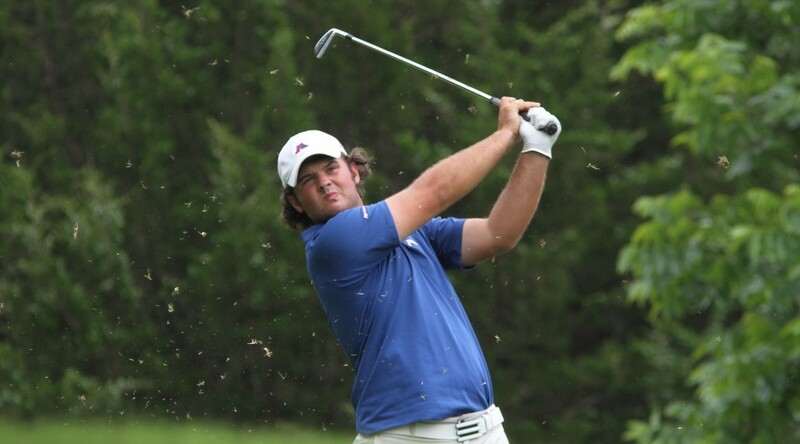 I golf championships with Augusta State University, Reed turned pro in 2011 and has been gaining momentum ever since. On Jan. 12, he won his fourth PGA Tour title at the Hyundai Tournament of Champions. Currently, he’s the 15th ranked golfer in the world according to the Official World Golf Ranking. In the final round of the 2015 Hyundai Tournament of Champions, former Jaguar men’s golfer Patrick Reed shot a 67 to claim the fourth win of his young career on the PGA Tour, joining Tiger Woods, Phil Mickelson, Rory McIlroy, and Sergio Garcia as the only players in the last 25 years to win four PGA Tour titles before the age of 25. Reed won the 2015 opening tournament over American Jimmy Walker when he rolled in a 19-foot putt in the first playoff hole. Four shots behind with four holes to play, Reed made two birdies, holed an 80-yard shot for an eagle and got just enough help from Jimmy Walker to win the Hyundai Tournament of Champions for his fourth career PGA Tour victory. It was up to Walker, who appeared to have control of the winners-only event until he tried to play it safe off the tee on the short par-4 14th and found a bunker, leading to his first bogey in 33 holes. Walker twice missed birdie putts inside 10 feet, and he missed an 18-foot birdie try for a victory in regulation. In the playoff, Walker’s chip went over the green, and he had a 6-foot par putt he never had to hit when Reed made his winning putt. It his Reed’s fourth win in his last 35 PGA Tour starts. Former Augusta State All-American Patrick Reed drained a seven-foot birdie putt on the second hole of a playoff Sunday afternoon to win the Wyndham Championship at Sedgefield Country Club and claim his first PGA TOUR title. Reed, 23, who led the Jaguars to NCAA Division I National Championships in 2010 and 2011, defeated Jordan Spieth when he rolled in the winning putt on the 10th hole, a 440-yard, slight dogleg-left, uphill par 4. From 167 yards out and in the woods right of the fairway, Reed punched a low, three-quarter 7-iron to avoid a limb after Spieth had just hit his approach to within 10 feet. Playing in the final group, Reed fired a final-round, 4-under 66 for a 72-hole total of 14-under 266 and finished regulation tied with Spieth, who finished one group ahead. Both players parred the first playoff hole at No. 18, with Reed missing a birdie putt from eight feet. On the second playoff hole, the 10th, Spieth’s 10-foot birdie effort just slid by on the high side of the cup, leaving Reed with a seven-footer for the win. Reed, a two-time All-American in 2010 and 2011 for the Jags, sank the putt and celebrated with his wife and caddie, Justine. With the victory, he became the fourth first-time winner in the last five years at the Wyndham Championship. He earned $954,000 for the win and easily went over the $1 million mark in earnings for the season. 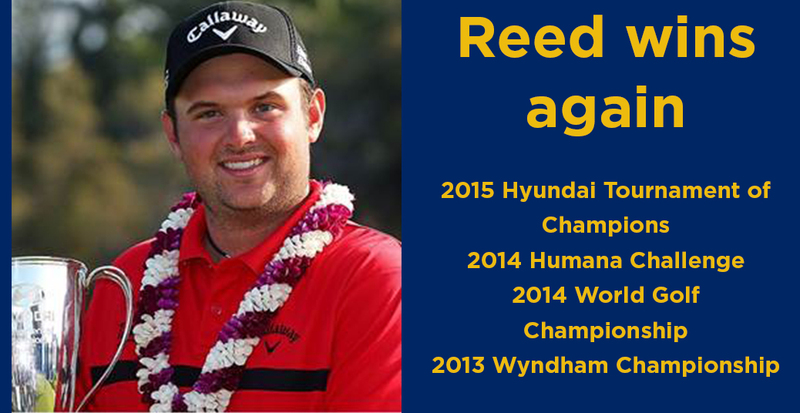 The win also gives Reed a two-year exemption on the PGA TOUR and qualifies him for the 2014 Masters Tournament. Reed moved up to No. 22 on the FedEx Cup points list and is guaranteed a spot in the FedEx Cup playoffs in at least The Barclays, the Deutsche Bank Championship, and BMW Championship. He will likely earn a spot in the field at the season-ending TOUR Championship presented by Coca-Cola. Fellow former Jaguar All-American Henrik Norlander enjoyed a nice week as well, tying for 16th on the strength of a final-round, 4-under 66.